This is a guest post from my friend Spencer at Military Money Manual. He’s really savvy when it comes to taking advantage of the credit card offers available to the military. I hope you find some useful nuggets in here! Thanks to recent changes in 2017 with Chase’s military policy, military servicemembers and their spouses can now get the best travel, hotel, and cash back credit cards available with no annual fees. That means you can get the excellent sign up bonuses and recurring annual benefits for no annual charge. Typically these cards carry $450-550 annual fees. These credit cards come with annual travel credits, airport lounge access, and automatic elite status at the largest hotel groups. Two of the largest credit issuers, American Express and Chase Bank, have extremely generous interpretations of the Servicemembers Civil Relief Act (SCRA) and the Military Lending Act (MLA). Both go above and beyond the letter and spirit of the laws and offer their products at no charge to military personnel and military spouses. American Express waives all annual fees on all of their business and personal credit and charge cards for US military personnel. If a servicemember is added as an authorized user to their non-active duty spouse’s account, the spouse can also get their annual fees waived. Chase waives annual fees on all of their personal credit cards for spouses and servicemembers. There’s no need to add an active duty authorized user to get the fees waived. 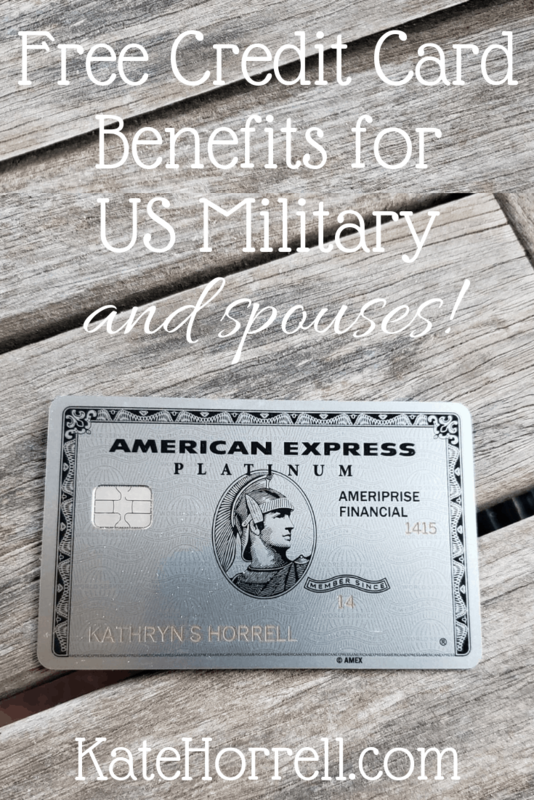 Who Qualifies for the AMEX and Chase Military Fee Waivers? As long as you are on active duty orders for 30 days or more, you are eligible to claim the benefits. This includes active duty, guard, and reservists. When you apply for the cards, select “military” as your income source. That should trigger an automatic or manual SCRA or MLA review of your account. The credit card company should then compare your Social Security number you used on your application to the Defense Manpower Data Center (DMDC), a DOD database that verifies active duty employment. This allows banks and credit card companies to rapidly and automatically verify your military service or dependent status. If you do get charged an annual fee, simply call the Chase Military Hotline at 1-800-235-9978 or from overseas 1-318-340-3308 or the American Express Military Hotline at 1-800-253-1720 or from outside the US 1-336-393-1111. The two best travel credit cards available right now are the Chase Sapphire Reserve and the AMEX Platinum. Both of these cards are regarded as the top travel credit cards available. As a military servicemember, you have a unique opportunity to pick up both of them with no recurring cost. I used these cards (among many others) to book 2 roundtrip business class tickets to New Zealand and Australia for Christmas and New Years Eve for under $300. We’re staying at a 5 star hotel in downtown Melbourne over New Years Eve for only 72,000 Marriott points. There is also the Chase Sapphire Preferred available with the $95 annual fee waived for military. Unfortunately Chase only allows each person to hold either a Preferred or a Reserve but not both at the same time. Therefore, it makes sense for military personnel to apply for the Sapphire Reserve, not the Preferred. When it comes to hotel credit cards, the name of the game is free night stays and elite status. The top hotel groups Hilton plus the now merged Ritz Carlton, SPG, and Marriott are just giving away elite status, free nights, and tons of points to military servicemembers. Note that normally these cards have an huge annual fee, which you can justify with the benefits offered and the annual free night. But that fee is waived for US military personnel, meaning you get an annual free night, all the other benefits, and don’t have to pay the annual fee! That’s an incredibly good deal for servicemembers. The American Express Blue Cash Preferred is a great cash back credit card. The $95 annual fee is waived for US servicemembers. You can get a $200 welcome bonus after spending $1000 in the first 3 months of Card Membership, an easy threshold to meet. The best part of this card is the 6% cash back on US supermarkets, including the DECA Commissary, all other the world. It works in Germany, Korea, the UK, the US, and wherever else you can find a Commissary. The same is true with the 3% cash back on US gas stations and select US department stores. The NEX and AAFES counts as a US gas station no matter where you are physically located. You also get 1% back on all other purchases. Why Do Credit Card Companies Offer these Deals to Military? My theory is its easier for them to comply with the MLA and SCRA laws by waiving all fees versus only waiving specific fees. Under the MLA, fees are calculated into your Military Annual Percentage Rate or MAPR. So, if you were charged a $450 annual fee and only spent $1000 on the card in the year, you could technically consider it a 45% MAPR. There is an exception in the MLA for “bona fide” annual fees on premium cards. So credit card companies do have an out if they want to start charging servicemembers annual fees. I suspect that since servicemembers make up such a small part of the population, we can fly under the radar for at least the next few years. While knowledge of the credit cards benefits for US military personnel is growing, it’s still a pretty niche market. Which cards do you have? Have you taken advantage of your MLA or SCRA benefits? Redeemed any awesome trips recently? Let us know in the comments! Are retired folks included in the above? Could you make an addition entry for us retired folks please? I’m unaware of any credit card companies that offer specific benefits to retired service members.